Hi Rob - I think I stumbled across this site when I was trying to see how much weight I needed to lose to get to my ideal - believe me - it's gonna take some work. This shot has me at 6'4" (won't be losing that, I imagine,) and 230 lbs. I'd really prefer to be around 210. Ugh. 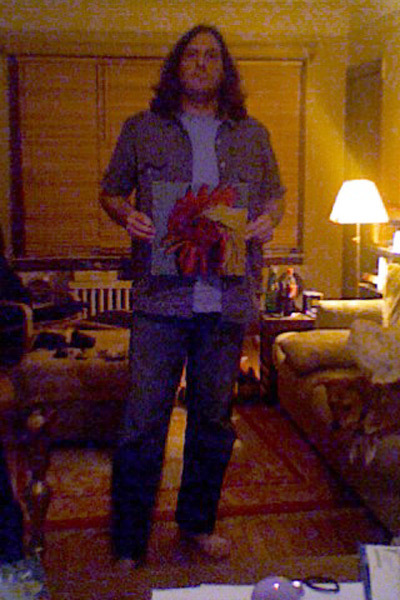 I decided to pose with a prop - it's a record I came across by a stroke of luck when I was working off my debt to society at Goodwill a few years ago - someone will recognize it as the cover of the Pavement EP, Watery, Domestic, which would be only half true - this is the cover of the record Pavement stole the image from and wrote crap all over for their cover - the original is an eponymous album by a terrible prog-/fusion band called Ambergris - one of these nine-member ensembles popular in the 70's - awful - listened to it for about two minutes, knowing it would be terrible but feeling I had to hear it. Breaking the law paid off in this small way, I suppose. Here's a link to my Blogger profile page, from which one can access (currently - 04/07/08) two of my amateurish and generally uninteresting blogs - I delete them and start anew here and there, so I can't say what will be there should anyone decide to take the trip.